David has been representing injured people since 1997. He brings with him a wealth of experience to his clients in the courtroom. David has handled all types of cases in the area of civil damage lawsuits, to include medical malpractice, premise liability, automobile and trucking cases, products and other personal injuries in both State and Federal courts. He has brought with him a wealth of experience to our firm. He is adding to the firm his drive for excellence for all of our clients. David has handled many different types of cases in the areas of civil practice and criminal defense in both federal and district courts. Bar Affiliations: Mr. Butler was admitted to the Oklahoma Supreme Court in 1997. He received his degree from the Oklahoma State University (B.A., 1994); University of Oklahoma (J.D., 1997). Mr. Butler is licensed to practice in the United States District Courts of Western and Eastern Districts of Oklahoma, and the Northern District of Texas. Member: He is a member of the Comanche County Bar Association. The Oklahoma Bar Association; the Oklahoma Association for Justice (formerly Oklahoma Trial Lawyers Association, and the Gerry Spence Trial Lawyer's College and graduated in 2005. He is a member of the American Association for Justice. 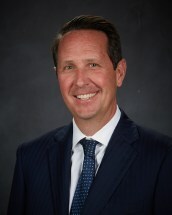 He is a member of the Bar Register of Preeminent Lawyers, Martindale Hubbell and is also Peer Review Rated by Martindale-Hubbell. He has been awarded the title of a Superlawyer, 2011. He was selected as an Oklahoma Top Attorney -- Outstanding Young Lawyer, 2012. Further, he has been privileged to be nominated to The National Trial Lawyers: Top 100.